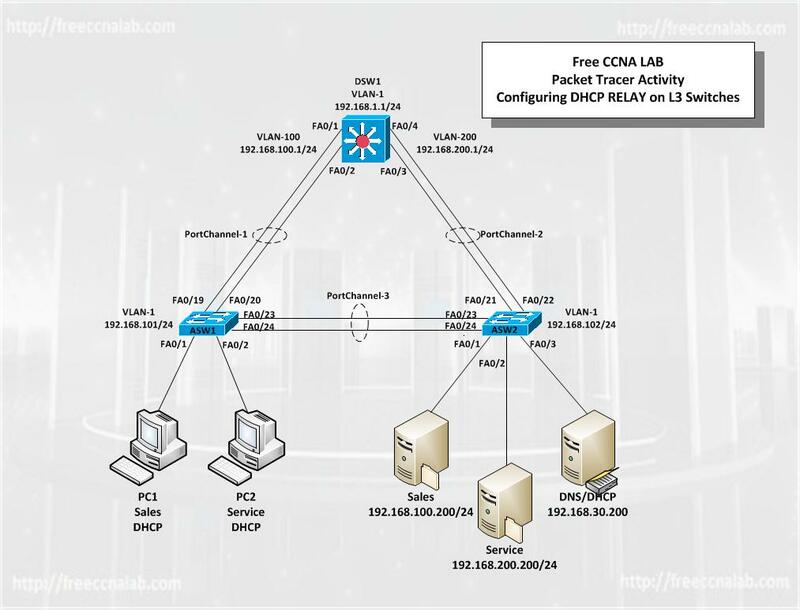 In this Free CCNA Lab Packet Tracer activity we will be configuring a 3560 distribution layer switch and two 2960 access layer switches. The network is segmented into four functional subnets using VLANs for better network management. The VLANs include Sales, Service, Data-Center, and a subnet for equipment management, which is the default management VLAN, VLAN 1. After VTP and Trunking have been configured for the switches, switched virtual interfaces (SVI) are configured on the distribution layer switch to route between these VLANs, providing full connectivity to the internal network. Finally you will configure DHCP Relay to allow the PCs connected to the Sales and Service VLANs to obtain DHCP assigned IP address. The DHCP and DNS server have already been addressed and configured with the Sales and Service address pools and the DNS information. The Sales and Service file servers are also configured. Configure a management IP address on VLAN 1 for each of the three switches according to the diagram. Configure default gateways on the access layer switches. Configure trunks and EtherChannels between switches. Configure the trunks and EtherChannel from DLS1 to ALS1. Configure the trunks and EtherChannel from DLS1 to ALS2. Configure the trunks and EtherChannel between ALS1 and DLS1 and between ALS1 and ALS2. Configure the trunks and EtherChannel between ALS2 and DLS1 and between ALS2 and ALS1. Create the following VLANs for the domain. Configure the host ports for the appropriate VLANs according to the diagram. Configure VLAN interfaces and enable routing. On DLS1, create the SVIs for VLANs 30, 100 and 200.